During a test drive near Ford's Michigan headquarters, the team noticed something strange with its self-driving cars. Each car shifted slightly at the same point in the lane "as if they were avoiding a pothole," says Jim McBride, Ford's senior technical leader for autonomous cars. The problem wasn't the cars -- it was the map. The team had just updated its 3D map of the test route, which helps guide self-driving cars. But a minor glitch caused one pixel on the map to have the wrong data value. It told the car a spot in the ground was raised 10 inches, when it was perfectly level. "The new map looked perfect to the human eye," McBride says. But not to the eye of a self-driving car. "A single incorrect pixel," he says, was enough to throw off the cars. The power of that tiny mapping glitch, which happened a few years ago, highlights the newfound importance of a product many consumers likely take for granted. For much of the last decade, digital maps have helped people pull up basic directions while walking and driving. But tech and auto companies are investing in a new generation of maps for a much more demanding audience: self-driving cars. These maps, often referred to as HD maps, go far beyond basic turn-by-turn directions. Some incorporate continuously updating data on lane markings, street signs, traffic signals, potholes and even the height of a curb -- all down to the centimeter. The maps help the car place itself in the world with a greater degree of accuracy, augmenting the sensors in the vehicle. As an example, McBride says maps can guide cars when the lane markings are covered by snow or a truck is blocking the car's view of a traffic signal. It can also free up car sensors to focus on detecting objects not included on the map, like pedestrians. Maps may not get as much attention as videos of self-driving cars on the road, or the LIDAR laser sensors at the heart of a blockbuster lawsuit between Uber and Google (GOOGL). But they are a key piece of the puzzle under the hood. Maps could help ensure safer deployment of self-driving cars in the next years. And they may just have the potential to create a new billion-dollar industry. "If you have an autonomous car, then the map is not going to be an optional feature," says John Ristevski, former VP of Here, a mapping business once owned by Nokia that offers HD maps. "It's going to be a core component of the vehicle that will produce ongoing revenue." 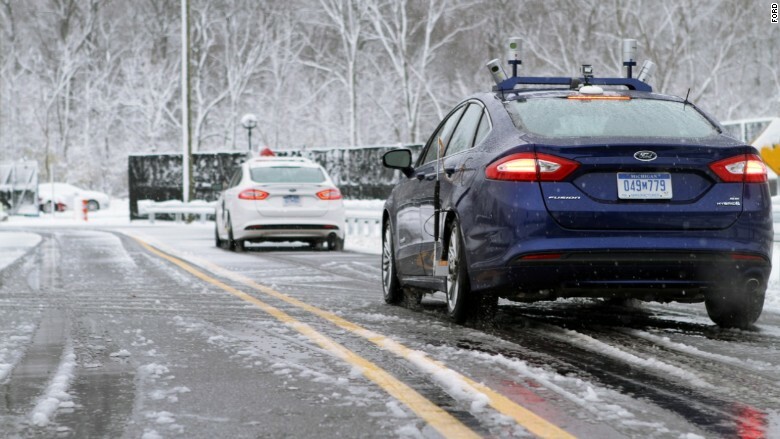 Ford's self-driving cars use 3D maps to navigate snowy roads. Unlike traditional navigation systems sold by companies like TomTom, HD maps may need to be updated as much as daily for certain regions. For example, a busy city street that goes through construction and pedestrian areas might need more frequent data than a long, uninterrupted freeway. Ristevski says that opens up the possibility of a subscription model that could one day bring in "billions" for mapping companies. The race to build up this next generation of maps is only getting more crowded. Google, Uber, Ford (F) and others are each working to collect data for HD maps with sensors in their autonomous cars. At Waymo, Google's self-driving car division, staffers parse out the data collected to identify objects like driveways and fire hydrants. The cars then "automatically send reports back to our mapping team whenever they detect changes" like construction, according to the company. But this approach is difficult even for companies with a strong bench of technical talent. 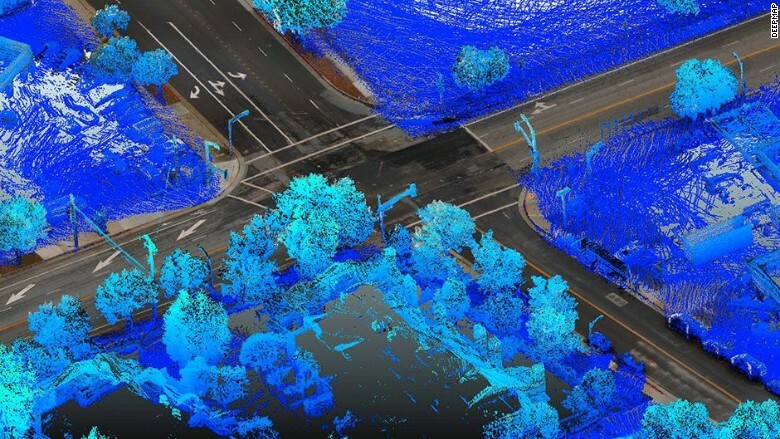 "If you thought creating regular maps for Google was hard, creating self-driving maps is much, much harder," says Brian McClendon, Uber's former VP of maps who previously worked on Google Maps. "The amount of data involved is huge. The precision required is very hard as well." 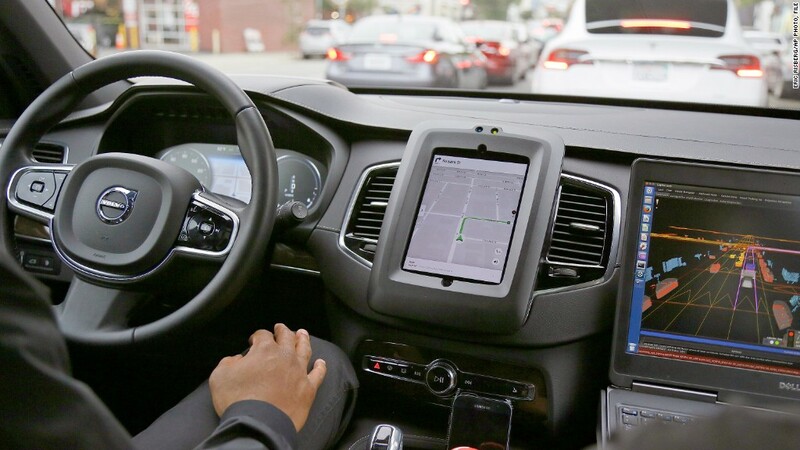 A number of automakers, including General Motors (GM) and Volkswagen (VLKAF), have opted to lean more on third-party services to get their maps off the ground. Related: Google's Waymo worth more than GM, Tesla and Uber? Mobileye, a self-driving car firm recently acquired by Intel for $15 billion, inked agreements with Volkswagen, BMW and Nissan (NSANF) for a mapping product in the first months of this year. The goal is to pool together mapping data from car manufacturers "to generate as much scale as possible," says Dan Galves, Mobileye's chief communications officer. "You can spend the money, hire the people -- assuming you can hire the right guys -- but that will take years. That happens too late for this race," says James Wu, a veteran of the mapping teams at Google and Apple (AAPL). His startup, DeepMap, announced $32 million in funding last month that will provide a "full-stack mapping service" to companies. Other mapping startups like Civil Maps, backed by Ford, and Mapbox are also working with automakers. Carmera, another startup, came out of stealth mode this week with $6.4 million in funding and plans to crowdsource "real-time" data for maps. That includes offering "pedestrian analytics" and a "real-time event feed" for construction and road closures. Google remains the obvious frontrunner. The company has deep pockets and a longer history investing in self-driving cars and mapping products like Street View and Google Earth. Lars Rasmussen, co-creator of Google Maps, remembers Google founders Larry Page and Sergey Brin telling his team years ago that they'd "have to spend billions of dollars" on maps "and it's worth it." "I think one of the reasons that [maps] excited Larry was that he had this idea of self-driving cars," says Rasmussen, who left Google for Facebook in 2010. Google may have won the first online mapping battle (sorry Apple), but the HD maps market is still in its early days. The winner -- or winners -- is far from the finish line. If you believe self-driving cars will eventually operate everywhere, then every city and street will need to be mapped out in granular detail. To put that in context, Uber's self-driving car team is currently mapping just one city, according to its website: Toronto. "It's a green field," says Sravan Puttagunta, founder and CEO of CivilMaps. "No company has established a majority market share, and even the ones that have a couple cities are spending billions maintaining those maps." As the race heats up, there is a lingering question in the industry about how useful these costly maps will be down the road. Some argue the cars will eventually get smart enough, with deep learning technology, not to need to rely on extensive maps. "In the short term, I can see where it's vital, but that long term may not even be 10 years," says Rebecca Lindland, executive analyst with Kelley Blue Book. The "conundrum," she says, is just as comprehensive maps hit the market, car companies "don't need them anymore." The team at Ford is "looking at the possibility" of developing algorithms for the car that don't require a prior map, according to McBride. But he's skeptical of ditching maps entirely. "You'd still save the data that you took the first time you drove there," McBride says, "and use it for the second, third and tenth time to make it better."